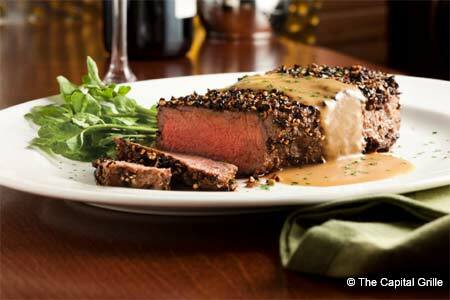 Generous servings of standard steakhouse faves plus an extensive after-dinner drinks list. : This steakhouse is bustling every night with diners primed to attack mammoth portions. High-rollers can start with an appetizer of beluga caviar served in regal style, but if you're not putting the meal on your expense account, opt for the tender lobster-crab cakes instead, or the wedge salad---a hefty chunk of iceberg lettuce crowned with blue cheese dressing and crumbled bacon. While there are some good seafood selections here, like the grilled Norwegian salmon with dill mayonnaise, it's the meat that rules, like the Prime porterhouse or the veal chop, sizzling with its Roquefort butter sauce. Sample the best of both worlds with the filet Oscar---ten ounces of filet mignon served with asparagus spears and colossal lump crab meat all drizzled with house-made béarnaise. Of the very good side dishes, we especially like the mountain of fried rounds of potatoes topped with fried shredded onions, probably enough for four hungry diners. Cap-off your meal with the creamy homemade cheesecake and check out the list of after-dinner drinks---perhaps the most extensive in town. Lunchtime diners will find a fine burger, but we can't resist the rich lobster salad accompanied by lots of good raisin-walnut bread.